I have been tagged for meme. Since my readership consists mostly of Finn’s grandparents and great aunts (otherwise known as the Auntiques because they are too cool to be just great aunts), I will clarify. A meme, rhymes with dream, is generally a pre-set list of interesting questions that you provide answers to on your blog, then tag some other bloggers to respond to the same questions. It is like a chain letter minus a stamp and the threat of bad karma. Hope you like ’em. Oh and I tag Jules, City Lizzy and Dandy Jack. She wasn’t exactly Mary Poppins. In fact, I broke the cardinal rule of hiring a nanny: The nanny must not be hot. She was twenty-five with doe eyes and a chestnut mane hailing from Eastern Europe. Finn was understandably smitten from the start. She worked Tuesdays and Thursdays giving me time to work in my home office or schedule client meetings. In the last few weeks, Finn started shouting “Katka” (her name in her native Slovakian) each time the door bell rang. He loves her and she loves him. Hours of books, trains, and walks form a bond. Sometimes I would feel a twinge at their secret giggles as I typed away downstairs. She is returning home to see her family after seven years. A concept that I simply can not fathom. She is torn between missing her family dearly and the “good life” in America with her husband. It is a rough patch. She is my friend too and I feel for her. We will miss our Katka. I am not sure what I will say to Finn when the doorbell rings next. Finn is no longer a member at Gymboree. He was warming up slowly to whole concept, but then I dragged him and the Captain to an open gym session. It was total chaos. A bunch of kids flinging themselves around at warp speed with, naturally, the ones with coughs and drippy noses chewing on mats, balls and other kids. Finn clung to my leg and stared in utter disbelief. We managed to get him to crawl on some stuff a bit, but he was not thrilled about it. Two days later, Daddy and Finn were laid up with vicious colds. Nasty stuff. Now, I am not a total germ phobe. I don’t dip the kid in Purel or chase him around with wipes. My general theory about germs is based upon Orson Wells’ War of the Worlds. The aliens arrive and are unstoppable. Our guns, tanks and planes are no match. It seems that we are doomed. Then something happens, the aliens start dropping like flies. They are defeated by an unlikely foe, bacteria. Unlike humans, they have no immune system, which has developed over thousands of years. In short, germs are good. We need them to be able to fight a good fight. I realize that this theory is somewhat flawed in that War of the Worlds is a work of fiction. It was, however, convincing enough to fool thousands of listeners into thinking that we were actually being attacked when it first aired. After some debate, we decided that Slymboree was not for us. I was surprised by my decision given my aforementioned War of the World theory on germs, but having a sidelined father and baby for almost two weeks makes you think about the situations in which you put your kid. If Finn was lovin’ the joint, it might have been a different story. Truthfully, I was the one that loved it with all the bright colors and cool equipment. He has been getting his workouts in our basement instead. We pull all the cushions off the sofa and create a super maze. I remember doing this as a kid with my Dad and building all types of cool forts with blankets and chairs. Finn squeals with delight: the reaction I had been hoping for at Gymboree. After his workout, he takes a steam. This is mostly to help with his congestion, but he seems to be very refreshed afterwards. As he and his father emerge from the bathroom trailed by a steamy cloud, the Captain announces, “Finn would like his white terry robe and Evian now, please”. Finn does not enjoy shopping. It is as if his father whispered in his ear, “If Mommy tries to shop, throw a fit.” As a dutiful son, he complies with the Captain’s orders. It has certainly curtailed my browsing time. Now, shopping is more of a recon mission. I must stay focused, locate the target item, and get out. This past week, I needed to buy some wedding shower gifts for two very lovely friends. I did not disclose the mission to the tot, until we were in convoy. Since he is now about-face in the car seat, he sensed our destination. I diverted his attention with some dried rations (aka raisins) and told him about all the fun things there would be to look at. I was giddy with delight outside the sparkling new two story Crate & Barrel in Bridgewater. I could have spent hours, but alas I knew I had precious few minutes. I wheeled him in and held my breath darting for housewares. It was early and not busy. I enlisted several salespeople to secure the goods. To my dismay, Finn seemed to actually enjoy whizzing about plus the ladies were fawning over him. He is such a shameless flirt. We were in and out in under 20 mins. No tears. No shouting. Mission accomplished. No toddlers or door jambs were harmed in the filming of this clip. Apparently, his father’s military training has rubbed off on the young lad. The Captain checks on on him each morning before heading out to catch the train. He tiptoed into the nursery and peered into the crib at the allegedly sleeping subject, Finn laid snoozing away prone on his belly complete with sound effects. As the Captain leaned over the rail to rub his back, Finn sprung from his belly directly to his feet to ambush the unsuspecting parental unit. The startled Captain absconded under the cloak of darkness to the dining room where the lad’s second line of defense was waiting. As the Captain quickly put on his shiny Johnston Murphy’s, he was ensnared in a booby trap. The clever lad had stuffed his dreaded tiny socks into the tips of his father’s loafers. Last year for St. Patty’s Finn did his best drunken sailor impersonation. This year he performed the jig. The wearing of the green was limited to green jammies since the young Lord of the Dance is still a bit under the weather. The Captain is concerned for two reasons. B) That in a few years I will tell him that we are off to karate class while we secretly attend a mother-son-all-you-can-jig Irish step dance class. Perhaps he is justified about the shaken baby thing. Shortly after our jig performance, Finn produced a very stinky very green diaper. Now, when I say green, I mean Shamrock Shake green. It was so unbelievably green that I wanted to take a picture. The Captain told me, “Have you lost your damn mind. You are not posting the poop on the internet.” And thus you are spared. What does it mean when she says “Blow“s? I wish it were a disco inferno, but it is a baby inferno instead. Little man spiked his first temperature yesterday. He was listless and very, very sad. The only good thing is that life slows down a bit to read loads of books and *gasp* cuddle. Mommy has got to take her cuddles anyway she can get them. Nights are rough especially for a boy who loves his sleep. He cried out for me at 1:30 and I found a red hot baby in the crib with scarlet cheeks and crusty nose. The panic set in as I dashed for the bathroom. A cold cloth on his head calmed him. He sucked down cold water and allowed me to check the temp – 102.4. Hot but he felt hotter. We rocked for a long while and he drifted in and out. For the rest of the night, I was Old Mother Hover checking his little head. By morning, the fever appears to have broken and he is up to old tricks toddling about. As for the cuddling, the moment too has past. Please read with your best brogue. Finn enjoys a good jig and a pint o’ milk. As any fine Irish lad should, he attended the Scranton’s 46th annual St. Patrick’s Day parade, which is always held the week before St. Patrick’s Day. I believe this is to allow for an entire week of revelry. Allegedly a production crew from The Office requested that the parade be moved up a few weeks to coincide with their schedule. Mayor Doherty supposedly replied, “We would not move the parade for the Pope.” Or so the tale goes. 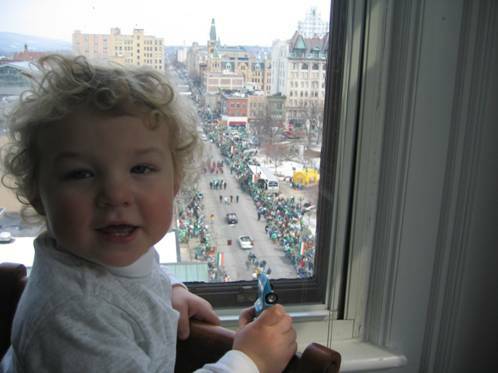 According to the parade association, it is the fourth largest St. Patrick’s Day parade in the United States. In 2003, there were more than 100,000 people lining the parade route and more than 5,000 participants. But I would guess that there are more people celebrating in Scranton’s many fine wateringholes than out in the street. The lines for the pubs are 4 or 5 deep and a block long by 7AM when the doors finally open. To avoid the mayhem, our friend’s father graciously offered our lot a flat (an apartment to the non-Irish) on courthouse square from which the kiddies could enjoy a prime view of the route. Young Joey Ramey takes in the sites and sounds of North Washington. 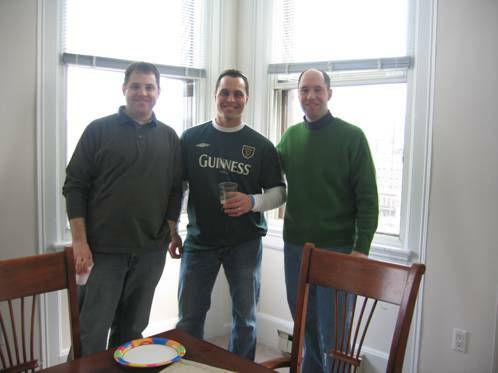 Eric Mullen, the strapping gent in the middle, works for Guinness and supplied beer, banners and beads. Tis’ good to have friends in high places. 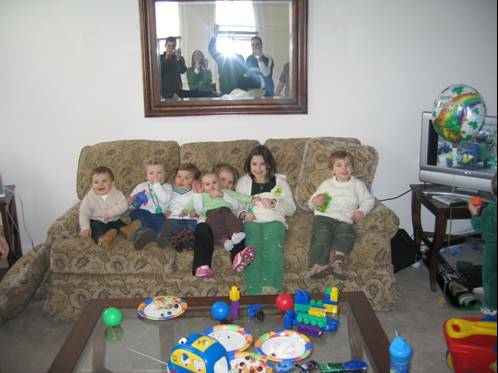 Ahh – the elusive Leprechaun photo opp! Gotta snap fast they move quick. Please note parents in the mirror. 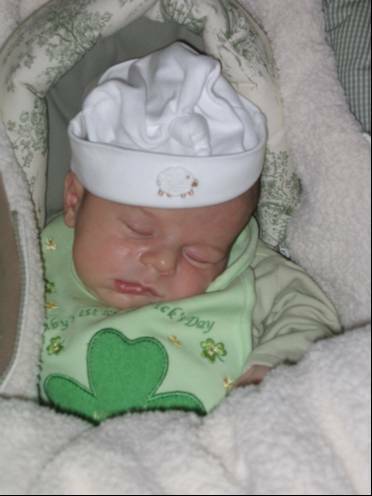 As I tucked the wee lad into bed that evening, I counted our many blessings among them life-long friends. You are currently browsing the Raising A Little Kane blog archives for March, 2007.